View All Reviews Canonical (SEO) - outputs a canonical tag to the listing detail page in the view all reviews page for a listing (to avoid Google considering the "view all reviews" page as a duplicate of the listing detail page). Enable User Reviews - if enabled, users will be able to review listings. 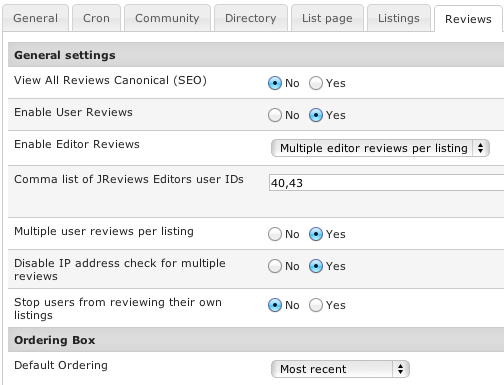 Multiple editor reviews per listing - this option will allow multiple multiple editor reviews by different users. It is not possible for a single user to submit more than one editor review. Comma list of JReviews Editors user IDs - only reviews written by these users will be automatically recognized as editor reviews. Addittionaly, any review can be marked as an editor review in the review moderation menu. Multiple user reviews per listing - valid for registered users only. Checking is done against IP address and userid. Disable IP address check for multiple reviews - performs check on user id only. Stop users from reviewing their own listings - also disable the review form in listing submission in Configuration => Standard Fields. Rating scale - enter a number higher than zero. 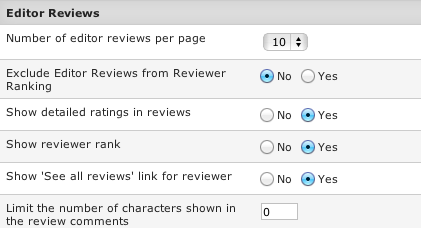 Once you have reviews on your site DO NOT change this setting. Rating increment - choose between 0.5 and 1. Rating selector in review form - choose between Star Images and Select List. Pre-select N/A for optional rating criteria - if enabled, users don't need to click on the N/A option to ignore a criterion. Hide non-rated criteria from detailed ratings - useful if there are many optional criteria. Show rating count in detailed ratings - this can be informational when users gave N/A ratings to certain criteria. Enable listing owner replies to user reviews - listing owners will be able to reply to reviews. Enable review discussions - a 'Comments' button will appear in every review that will take users to a separate review detail page where they'll be able to discuss the review. Enable reporting of user reviews - if enabled, every user review will display a "report review" icon in bottom right corner. All reports will be sent to the JReviews administration area. Enable reporting of editor reviews - if enabled, every editor review will display a "report review" icon in bottom right corner. All reports will be sent to the JReviews administration area. Enable user review voting - if enabled, visitors will be able to vote on review helpfulness. 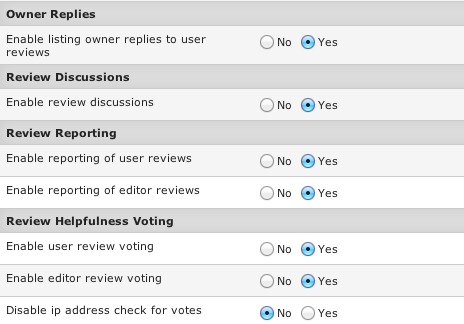 Enable editor review voting - if enabled, visitors will be able to vote on review helpfulness. Disable ip address check for votes - by default, JReviews will prevent visitors from voting multiple times. Here you can disable IP address check (for testing purposes).